Discussion in 'Lexus Lounge' started by Tragic Bronson, Nov 14, 2016. 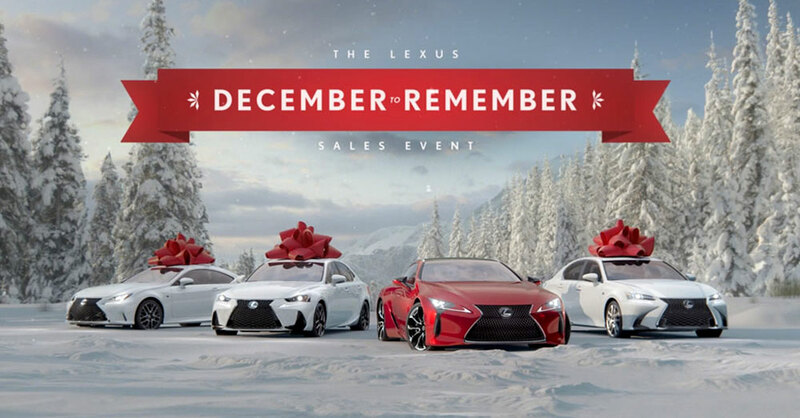 In 1998 Lexus came up with a pretty simple idea: Put a big red bow on a car for a holiday campaign and call it the "December to Remember" sales event. Eighteen years later the campaign is still running strong with the ads emerging as a holiday marketing tradition on par with Coke's Santa Claus or Corona's iconic O' Tannenpalm spot. Car buyers don't just like the big red bows, they demand them in ads and in dealer showrooms. Yes, people apparently really do give Lexus vehicles as Christmas gifts, a concept that was spoofed by "Saturday Night Live" in 2002. "Sometimes it is a surprise for a spouse, but a lot of times the family is going to purchase a new car and they make it a little surprise around Christmas," said Lexus VP-Marketing Brian Smith. "Many, many dealers have to actually schedule the use of their big red bow. It used to be that every dealer had one … and now many of the dealers have purchased two, three, four bows." Buyers borrow the bows so they can "surprise their family when they bring a new car home," he said. This year's campaign kicks off on Monday and will include five general market TV ads and two placed in multicultural media. The ads spotlight children being used as middlemen by adults looking to get their Lexus wish list to Santa Claus. With such a long-running campaign, "you are under pressure every year to keep it fresh and relevant and current with the times," said Chris Graves, chief creative officer at Lexus agency Team One, which is the luxury, premium agency within Saatchi & Saatchi. For instance, amid an economic downturn in 2012, ads encouraged people to get out of their house and hang out with friends -- by driving a Lexus vehicle, of course. This year's theme is about how "as an adult you can still experience that childlike joy and wonder of getting the gift you always wanted," Graves said. "Kids seem to have the connection to Santa. So the whole campaign is about how adults are finding a way to manipulate that relationship in a fun way." For Lexus -- and other auto marketers -- holiday sales events have emerged as one of the most important marketing tools of the year. As such, Christmas creep has hit the auto market with brands deploying their holiday ads well before Thanksgiving. This year, Nov. 1 was the kickoff, said Michelle Krebs, senior analyst for AutoTrader. Automakers are "riding the coattails of other retailers, and Amazon, which started Black Friday offers early," she said. December sales could be particularly important this year as the industry seeks to match last year's annual sales record, she said. "We know that sales are plateauing and incentives are increasing," Krebs said. "Depending on how aggressive automakers get with incentives and promotions and how well consumers take advantage of them, we expect sales to be down 1 percent or up 1 percent from a year ago. So it could be another record breaker -- but maybe not." Automakers already in market with holiday campaigns include Audi, whose "season of Audi" sales event includes an offer by the automaker to cover the first month's lease payment on select models. Infiniti is taking a new -- and less salesy -- approach this year by partnering with the Arbor Day Foundation to plant 35,000 new trees on behalf of drivers. From Nov. 9 to Dec. 31, visitors to Infiniti retailers will receive an ornament that represents one of the donated trees. "The holidays can be overwhelming and full of expected clichés like big red bows and blowout sales events," Allyson Witherspoon, director of marketing communications and media at Infiniti Americas, said in a statement. "This holiday season, Infiniti wanted to break these norms and empower our drivers and employees by paying it forward with these tree donations." Lexus is offering complimentary first month's payment on some models, according to its website. The brand is seeking momentum after total Lexus sales fell by 4.7 percent in the first 10 months of the year to 260,996 vehicles. "Everybody was concerned what November/December was going to look like following the elections and things feel pretty stable," Smith said, pointing to the stock market uptick in the two days following Donald Trump's victory. "The luxury industry is a little more dependent on what goes on in Wall Street than much of the general market, so that's a really good sign." Den, Ian Schmidt and Trexus like this. Ian Schmidt and Brooks2IS like this. Five new commercials for the holiday season. Trexus and Den like this. Spread a little love this year! Dear Santa, I would like a 5LS as soon as possible. Oh, and if it's possible, F models of every Lexus.